Daddy is no longer with us, so I can't call and get his advise. These are some of the lessons that I learned from him. They will be with me forever as will my memories of being in the garden with him. I hope you find the tidbits helpful too. Garden onions are ready to be pulled when the green tops begin to wither or turn brown or fall over. In Denver, Colorado this begins sometime in late July or August. Daddy always harvested before heavy rains. He said the onions could rot if left in wet soggy soil. Buddy's Old Maids. I never really understood Daddy's fascination with Old Maids (zinnia's to the rest of us). He could have been the 'Johnny Apple Seed' of these classic favorites. He must have bought a package of seeds, who knows when. The seeds from that first crop generated more blooms at our house, at church, and numerous of other yards. 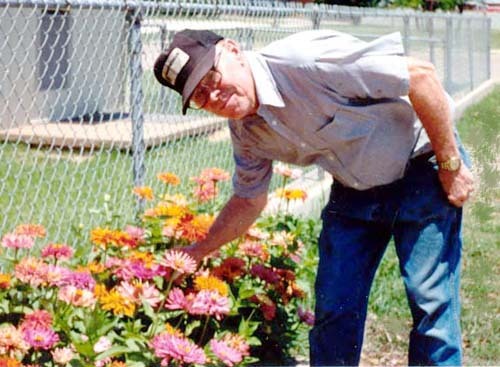 He saved seed heads in a brown bag and planted them the following year. Zinnias will always play a dominate role in my garden. Cleaning Flower pots. Daddy's ritual for cleaning clay Flower pots was to give them a soaking bath in hot water for an hour or so. He said this was a good way to remove crusted mineral salts. He used a small metal brush dipped in liquid dish soap to scrub off the salt. After they were clean he put them in a tub with 9 parts water to 1 part household bleach (at least this is the ratio that I surmised - Daddy never measured). He left them in the tub for about 10 minutes. I read on the Internet that you can reduce salt build-up on clay pots by wiping them on a weekly basis with a sponge soaked in plain white vinegar. Stop tomatoes splits. I complained to Daddy that my tomatoes were splitting on the vine. He told me that I needed to be more consistent in watering them. He said tomatoes tended to split when there is too much water. Second Cabbage Crop. Daddy had a curious habit when harvesting cabbages. He always made two shallow cuts. When he cut a cabbage, he put two nicks crosswise on the top of the stump, and within a month or six weeks it will sprout again with a crop of tender greens. Storing Onions. Daddy stored onions in a bin in his garage. I don't have such a bin so I just put the newly pulled onions on paper towels or sometimes newspaper and leave them on my kitchen table. I let them "cure" that way for a few days. I wait until the outer skins are completely dry. They have the papery crisp skins like the onion I buy in the grocery. Leave undisturbed until the outer skin becomes papery and crispy dry. Daddy kept his onions in the bin for several months. I don't produce enough to worry about storing them. I use them as soon as possible. Can't beat the flavor of home-grown onions. Bright paint ended hide 'n' seek. One of my jobs as a little girl was to paint the handles of Daddy's gardens tools with a color other than green. He said the bright colors help him find the trowel when it got lost. Its a good idea - painting the handles of garden tools in bright colors, such as red or orange, it not only preserve the wood but also makes them easy to spot. I purchased tools that have brightly colored handles. Never bought Blooming Plants. On the rare occasions that we went to the nursery, Daddy would never let me put blooming plants into our shopping cart. He told me to look at the plants with blooms and then pick ones to plant without them. He said that the blooms will be more spectacular from these non-blooming plants. This is a "rule" I still follow. Plant tall vegetables on the north side. Daddy planted corn and okra on the north side of the garden so that these taller plants didn't shade the other plants. Dry is better than soaked. In watering the garden, Daddy said that too much water is worse than not enough water. It is easy to give a plant more water but you can't take water away. Ripe on the vine - indoors. Daddy always had tomatoes at various stages of ripeness when winter started coming. He just pulled them up the whole plant and hung them upside down in the garage. Lo and behold, the tomatoes ripened on the vine. The garage was a warm dry location. No More Aphids. Daddy had the curious habit of burying banana peels at base of rose bushes. As I recall, he just covered them with dirt and didn't burry them very deeply. He claimed that the decomposing banana peels prevented aphids. Daddy's garden from time to time would be invaded by snails. He put a shallow dish of beer next to the snail's favorite plants. I guess the snails loved beer because they would drown themselves in the beer. Let the Moon be your Guide. Daddy said to plant above ground plants when the moon is waxing or growing and below ground plants when the moon is waning or shrinking. Here's a link to a moon phase/sign calculator. Mailbox for storage. Daddy had a old mailbox planted at the entrance of his garden. As a kid, I used it to hid treasures, he used it to keep garden tools close by. I keeping looking for old mailboxes at garage sales, haven't found one yet. Attracting good bugs. Daddy never harvested all the carrots that he planted. Living in Texas where winters are "mild" he left some in the ground. Next season they made the prettiest flowers and attracted the good bugs that eat the bad bugs to the garden. If you have never seen carrot flowers, they look a lot like Queen Anne's Lace. Sunflower Plants as Supports. Daddy was always one to "kill two birds with one stone" so to speak. One example of this was that he planted six pole bean seeds in a triangle (2 seeds at each point) and then planted a mammoth Sunflower seed in the middle. The Sunflower provided an excellent support around which the beans grew. I suppose you could do the same thing with cucumbers. Dad had a big garden and always left the cukes to sprawl out on the ground. Marigolds Keep Bugs Away. Daddy scattered French marigold seeds throughout his garden. Not only were they a pretty surprise but also helped keep the bad bugs away. I know now that is an accepted companion gardening practice. When I was little I just thought it was pretty. He also planted garlic throughout the garden for the same reason. Wet Newspapers. To solve the emergence of weeds around his vegetables, Daddy put down several sheets of newspapers. Keeping them wet, prevented weeds from coming through. Epsom Salt for Tomatoes. After the tomato plants were established, Daddy mixed a little epsom salt into the soil at the base of tomatoes & pepper plants. He claimed that it made them more productive and taste better. I know that the tomatoes from his garden certainly tasted better than store bought. I later learned that epsom salt adds magnesium and that is a good thing. As I recall he also buried most of the young tomato plant because it sent out more roots from the buried stalk. Encourage Cuttings. When Daddy was ready to propagate some cuttings, he would boil 1/4 c honey + 3/4 c water. After the "root stimulator" cooled he would pour it into a container and plop the cuttings into it. He left them in the solution for a few days and then either put them in soil or in clean water. Keep Gardening Tools Sharp. Daddy took great care of his garden tools. He kept a bucket of sand in the garage. At the end of his gardening day, he would plunge the heads of your garden tools into the bucket of sand to keep them sharp. He would also wipe them down with an old oily rag. He said that kept them from rusting.